Hurlbert made numerous references to the Irish in America throughout his book, often associating the entire cohort with its most radical and violent separatist elements. He also challenged more conventional political action. It is undoubtedly the opinion of every Irish American who possesses any real influence with the people of his race in my country, that the rights and liberties of Ireland can only be effectually secured by a complete political separation from Great Britain. Nor can the right of Irish American citizens, holding this opinion, to express their sympathy with Irishmen striving in Ireland to bring about such a result … be questioned. … But for all American citizens of whatever race, the expression of such sympathies ceases to be legitimate when it assumes the shape of action transcending the limits set by local or by international law. It is of the essence of American constitutionalism that one community shall not lay hands upon the domestic affairs of another; and it is an undeniable fact that they sympathy of the great body of American people with Irish efforts for self-government has been diminished, not increased, since 1848, by the gradual transfer of head-quarters and machinery of those efforts from Ireland to the United States. … It is not in accordance with the American doctrine of ‘Home Rule’ that ‘Home Rule’ of any sort for Ireland should be organized in New York or in Chicago by expatriated Irishmen. Hurlbert was a Harvard undergraduate when waves of Famine immigrants arrived in America and the Young Ireland Rebellion of 1848 was suppressed in Ireland. 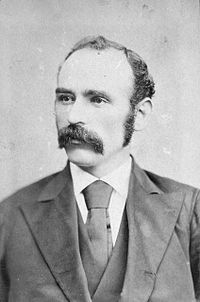 His newspaper career spanned the rise of the anti-Catholic and anti-Irish Know Nothing Party, the New York arrival of the Cuba Five, and the 1880 American tours of Michael Davitt and Charles Stewart Parnell. As the two nationalists gave their speeches that year, an estimated 1.85 million Irish-born people lived in the United States, with another 3.24 million born in America to Irish parents, a total of just over 10 percent of the population. Another 655,000 Irish immigrants arrived during the 1880s. 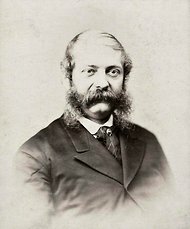 In addition to Parnell and Davitt’s travels in America, Hurlbert also mentioned events such as the 1880 Irish Race Convention in Philadelphia and 1886 Irish National Convention in Chicago, addressed by John Redmond. Prime Minister William Gladstone’s 1886 Home Rule bill, he wrote, “was simply intoxicating” to Irish America. 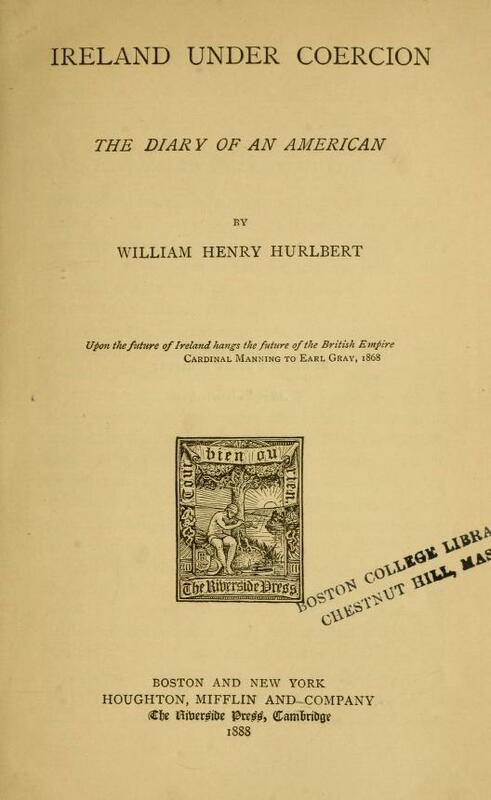 Hurlbert did little to distinguish the competing strands of Irish nationalism in America or Ireland. Instead, he focused on its most radical elements, as expressed in this passage from the Appendix. 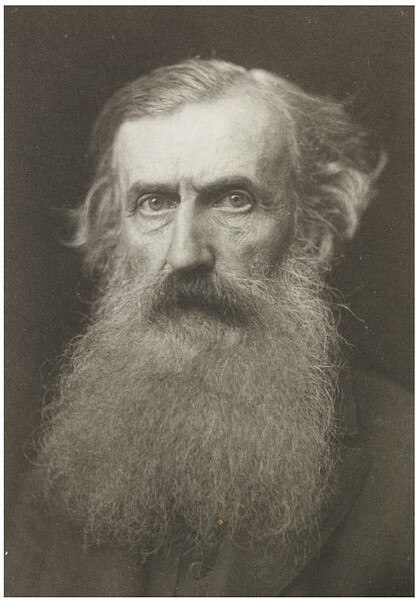 The relation of Mr. Parnell and his Parliamentary associates to what is called the extreme and “criminal” section of the Irish American Revolutionary Party can only be understood by those who understand that it is the ultimate object of this party not to effect reforms in the administration of Ireland as an integral part of the British Empire, but to sever absolutely the political connection between Ireland and the British Empire. 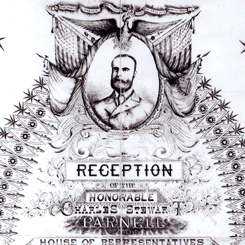 … If Mr. Parnell and his Parliamentary associates were to declare in unequivocal terms their absolute loyalty to the British Crown, they might or might not retain their hold on Mr. Davitt and upon their constituents in Ireland, but they would certainly put themselves beyond the pale of support by the great Irish American organizations. Nor do I believe they could retain the confidence of those organizations if it were supposed that they really regarded the most extreme and violent of the Irish Revolutionists, the “Invincibles” and the “dynamiters” as “criminals,” in the sense in which the Invincible and the dynamiters are so regarded by the rest of the civilized world. 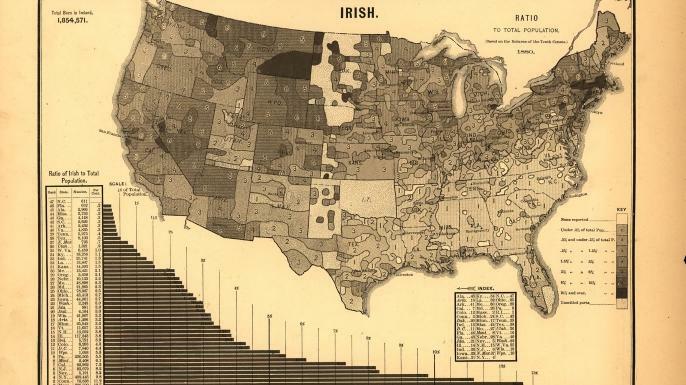 Irish population in the United States, 1880. Hewes, Fletcher W, and Henry Gannett. Scribner’s statistical atlas of the United States, showing by graphic methods their present condition and their political, social and industrial development. [New York, C. Scribner’s sons, 1883] Map. Retrieved from the Library of Congress. NOTES: From pages x (Ford, in Preface), 2-3 (Prologue), 14 (Devoy), 386 (Rossa), 432-433 (Appendix), and 466 (Top quote), of Ireland Under Coercion: The Diary of an American. … Pages 9 and 37 of A Greater Ireland: The Land League and Transatlantic Nationalism in Gilded Age America, by Ely M. Janis, University of Wisconsin Press, Madison, 2015. This entry was posted in History, Irish America, IUC, Revisted, Politics and tagged Charles Stewart Parnell, Home Rule, Jeremiah O'Donovan Rossa, John Devoy, John Redmond, Michael Davitt, Patrick Ford, William Gladstone on May 24, 2018 by admin. 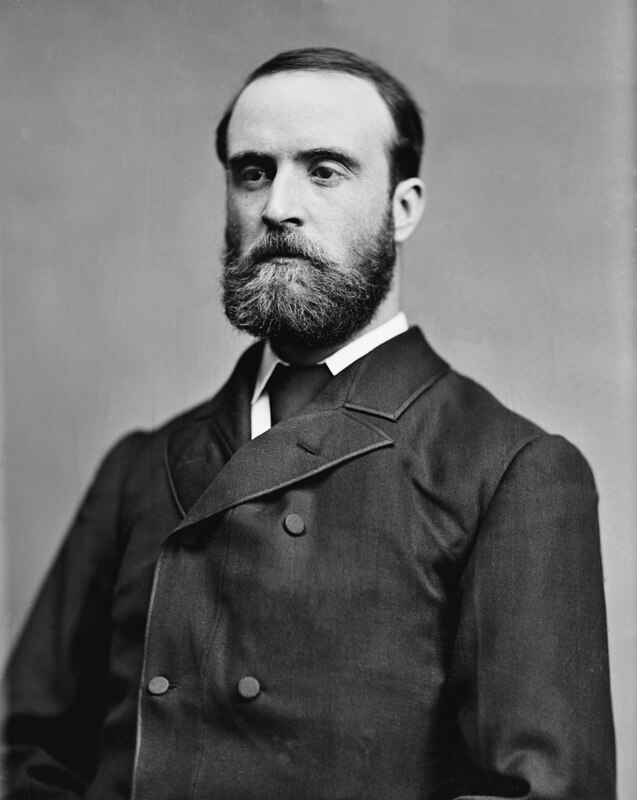 In the early 1880s, agrarian agitator Michael Davitt and Irish Parliamentary Party leader Charles Stewart Parnell partnered in an bid to secure domestic political autonomy for Ireland–Home Rule. The effort got financial and political support from the Irish in America, roused by visits from Davitt and Parnell. Despite the support of Liberal British Prime Minister William Ewart Gladstone, however, the legislation was defeated by unionists in 1886, two years before Hurlbert’s arrival in Ireland. 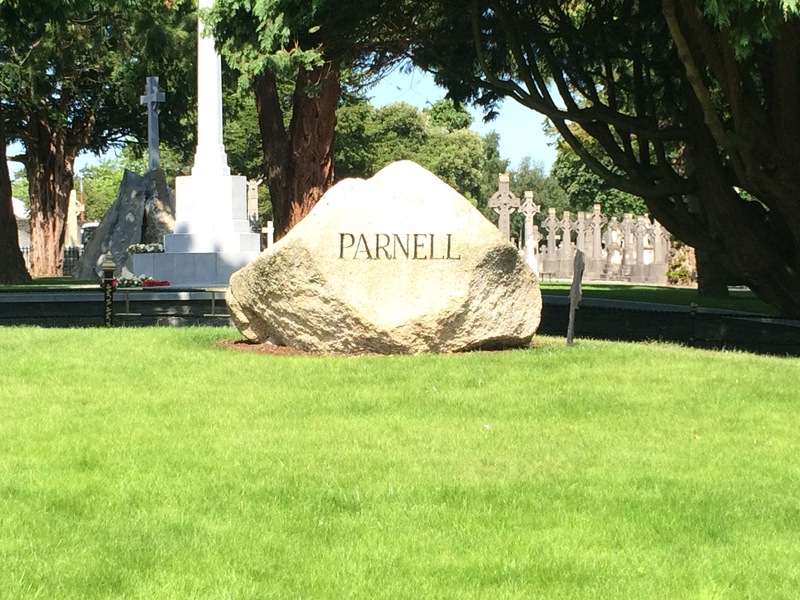 Within months of Hurlbert’s visit to Ireland, Parnell would face a special commission called to investigate his alleged links to two 1882 political murders. Though cleared two years later, he soon was scandalized by revelations of his extramarital affair with the wife of one of his parliamentary colleagues. 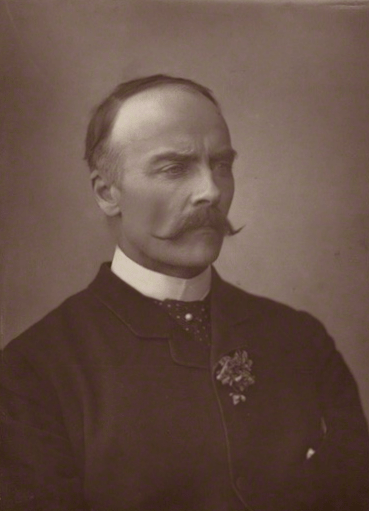 He died in 1891, two years before a second Home Rule bill was raised (and defeated) in parliament. Later, Hurlbert attended a meeting of Irish unionists, where he heard a speech by Colonel Edward James Saunderson. The M.P. for North Armagh (now part of Northern Ireland) asked the audience whether they could ever imagine being governed by “such wretches” as the Parnellite nationalists? “Never,” the crowd replied in what Hurlbert described as “a low deep growl like the final notice served by a bull-dog.” Ian Paisley and his unionist supporters echoed the response 97 years later outside the Belfast City Hall. NOTES: This post is based on the Prologue and pages 53 to 70 of Ireland Under Coercion: The Diary of an American. This entry was posted in History, IUC, Revisted and tagged Charles Stewart Parnell, Colonel Edward James Saunderson, Home Rule, Ian Paisley on January 12, 2018 by admin. Happy New Year. For 2018, I’m producing an open-ended, work-in-progress blog serial about the 1888 book Ireland Under Coercion: The Diary of an American, by William Henry Hurlbert. #IUCRevisited. 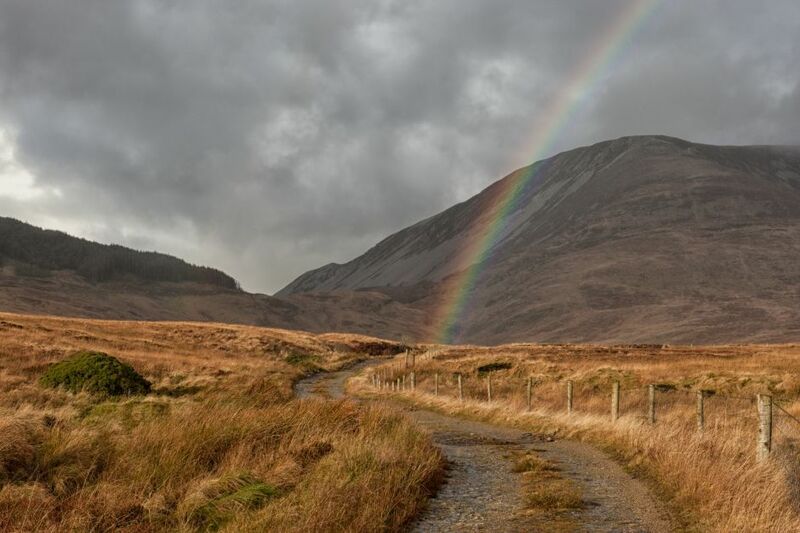 This blog serial will explore late 19th century Ireland through the people, places and events Hurlbert detailed in his travels. I will supplement his original text with background material and my own 21st century perspectives. 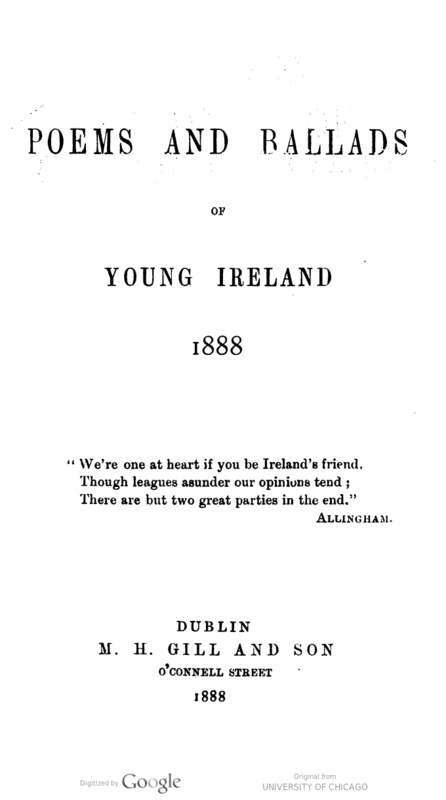 The posts not only will cover the Land War and Home Rule conflicts of the day, but also other aspects of life in Ireland at the time, and Hurlbert’s numerous references to the Irish in America and the November 1888 U.S. presidential election. 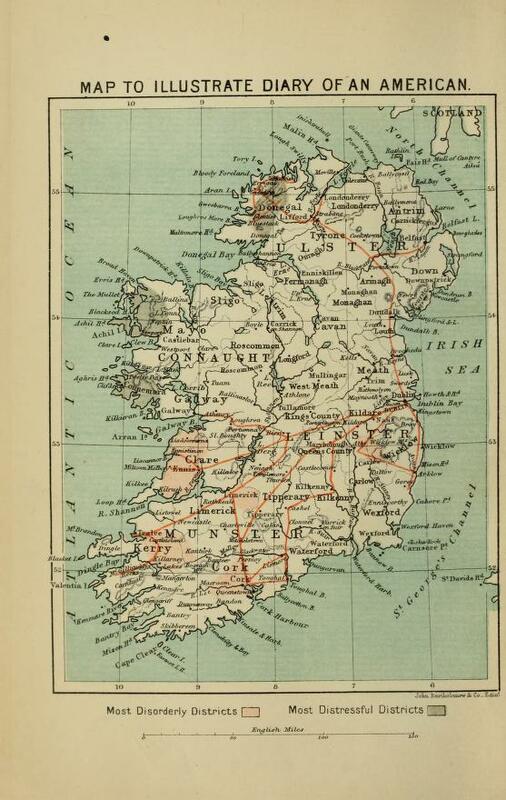 The book is written in a travel diary format, beginning with his 30 January 1888, arrival in Dublin, and ending with a 26 June 1888, entry from Belfast. The Preface is dated 21 September 1888. I will quote extensively from the passages, but edit Hurlbert’s frequently meandering sentences. I am 81 pages into the 475-page book. As I get deeper in the text, I will begin to cross-reference and circle back to earlier book passages and blog posts, as appropriate to understanding the material. Reader questions and suggestions are welcome. Thanks for joining me–and William Henry Hurlbert–on this adventure through “Ireland Under Coercion,” Revisited. NOTES: Quotes from pages 8 and 10 of the Prologue to Ireland Under Coercion: The Diary of an American. Most hyperlinks on people’s names or places are to Wikipedia for consistency and ease of production. I am maintaining a People, Places & Events reference on the project landing page. This entry was posted in History, IUC, Revisted and tagged "Ireland Under Coercion", 1888, Home Rule, Land War, William Henry Hurlbert on January 1, 2018 by admin. One hundred years ago, during the first week of April 1917, the United States entered World War I. 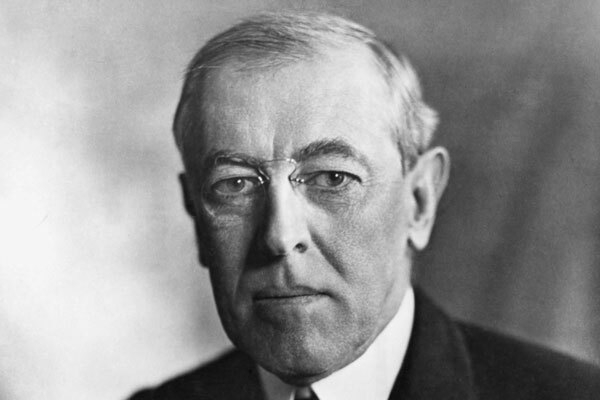 President Woodrow Wilson could no long maintain his pledge of neutrality since the war began in 1914, and Congress supported his decision. The American draft began in June 1917. “Ireland’s interest in the great decision is obvious,” the Freeman’s Journal editorialized. The moderate nationalist newspaper viewed America’s entry in the war as “vindication” for John Redmond, who in 1914 urged Irish soldiers to go “wherever the fighting line extends” in support of Britain. His call shifted Irish American support from home rule toward more militant Irish nationalism and Germany. “America today is Ireland’s ally, as desired by Sinn Féiners, but she is Ireland’s ally because the Irish leader from the beginning set Ireland’s feet on the one path that every friend of freedom was bound to tread,” the Freeman’s Journal concluded in April 1917. Redmond and others in the Irish Parliamentary Party believed that America’s presence not only ensured victory on the battlefield, but also guaranteed the implementation of home rule, the limited domestic autonomy for Ireland approved just before the war, but put on hold because of the outbreak. The IPP’s view was mistaken. Militant Irish nationalism, fueled by the 1916 Easter Rising and Britain’s execution of the rebel leaders, continued to manifest with Sinn Féin‘s 1918 electoral victories and the Irish War of Independence. The time for home rule had passed. The president understood that Irish Americans were a loyal constituency of his Democratic Party; however, he viewed the situation in Ireland as an internal matter to be resolved by the government of the United Kingdom. Bobbing and weaving like a prizefighter, Wilson hoped he wouldn’t alienate any segment of Irish America. His political ducking and dodging worked to his advantage for just so long. 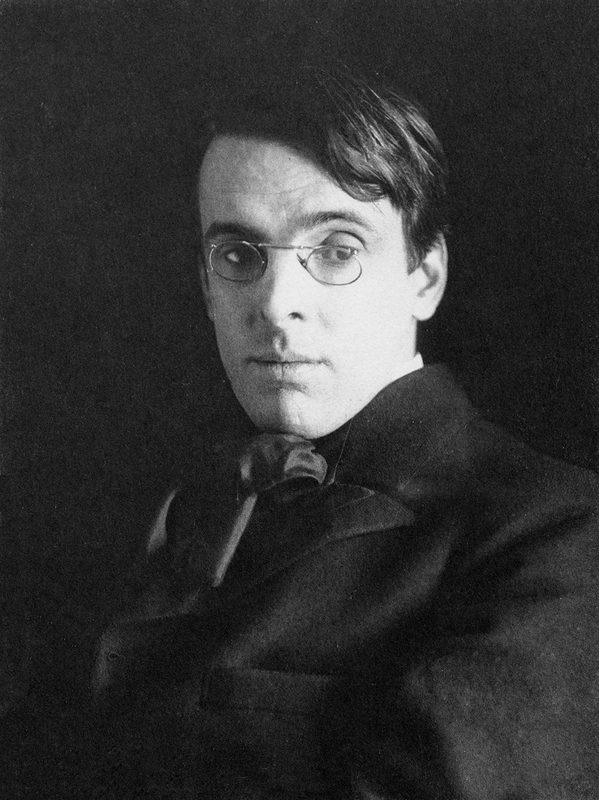 Following the Armistice, Wilson once again faced the appeals of Irish-Americans to recognize Ireland as one of what he had called the ‘small states’ that deserved ‘self-determination’. … At the Paris Peace Conference of 1919, which ultimately produced the Treaty of Versailles and created the League of Nations, Wilson refused to allow the subject of an Ireland divorced from the United Kingdom to enter the formal post-war deliberations and discussions. Despite persistent efforts by the American Commission on Irish Independence to get the president to realize how his numerous calls for ‘self-determination’ had rallied the Irish and Irish-Americans throughout the Great War, the obstinate Wilson remained steadfast in his opposition to raising the fate of Ireland. This entry was posted in History, Irish America, Politics and tagged Home Rule, Irish Parliamentary Party, John Redmond, Sinn Féin, Woodrow Wilson on April 4, 2017 by admin. A 90-minute documentary tells the story of Ireland’s struggle for independence from Home Rule to Civil War through beautifully colorized newsreel and photos. British Pathé, one of the world’s largest newsreel archives, attempted to make a similar film in 1935. It was blocked by Éamon De Valera’s Irish government at the time, in part because of the violence of the Civil War period, according to The Irish Times. This entry was posted in Arts & Culture, History and tagged Civil War, Eamon De Valera, Home Rule on October 25, 2016 by admin.